Fresh, simple, and entertaining – a zesty new kosher cookbook experience! Who says the kitchen is just for cooking? 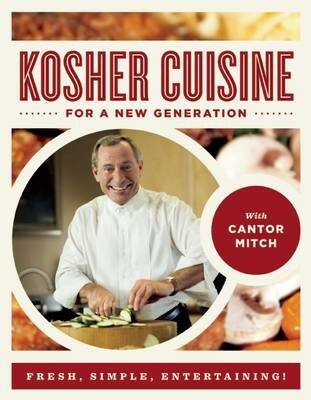 Cantor Mitch brings kosher cooking to a new generation and away from the stove. With over 75 recipes and lay-flat binding, Kosher Cuisine For a New Generation is the perfect kitchen companion for anyone looking to put the chutzpa in cooking. With song and music pairings for each recipe, this is not your average cookbook. Whether you’re looking for soups, salads, or Bubbie’s favorite recipes, you're sure to find it and more in this one-of-a-kind creation from the infamous singing chef!